Dedicated on July 18, 1898, the Gasconade County Courthouse is thought to be one of the few courthouses in the United States built entirely with private funds. Charles D. Eitzen, a self-made millionaire, willed the sum of $50,000 to Gasconade County for construction and furnishing of a new courthouse. The present structure is the second building on the same site to serve as the courthouse. The first was a square, two-story brick building with a hip roof that cost $3,000. Paid for by the City of Hermann, it replaced a 20 by 24-foot log hut at Mt. Sterling. 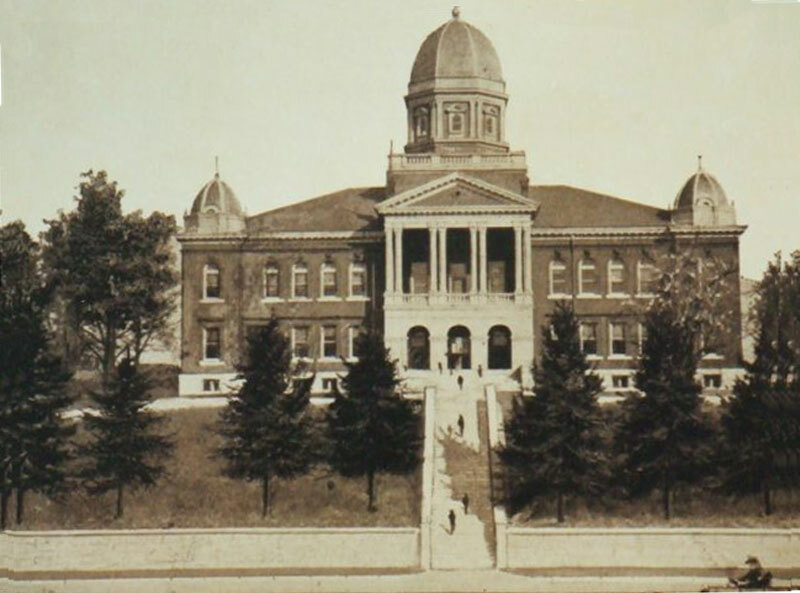 The building was was razed in 1896 to make way for the present courthouse. A new metal roof was installed in 2017. Original plans for the new courthouse building, designed by architects J. B. Legg of St. Louis and A. W. Elsner of Jefferson City, called for light-gray or medium-buff brick with terra cotta trim. 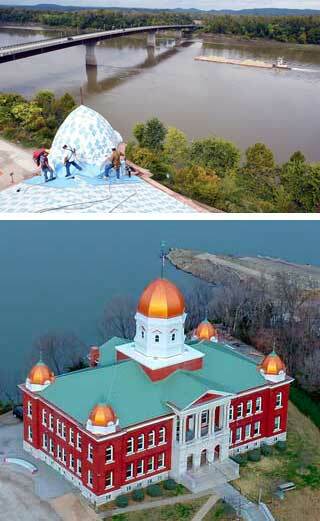 The main roof was to be dark Pennsyvania slate, and the tin dome roofs were to be painted a copper color. The rotunda and corridors were to be tiled in Italian marble and mosaic. After bids were opened, the plan was modified to eliminate some of the more costly specifications. Most notably, the new plan called for red brick with stone trim. More than 400,000 bricks went into the new courthouse. Bricklayers brushed bricks with beer (cheaper than vinegar in those days) to make them shine and even out the color. On February 3rd, 1905, the building was heavily damaged by fire, which destroyed the dome, roof, and a large portion of the second floor. Repairs were completed in December 1905. The courthouse today remains little changed from its original design. Murals by area artists depicting the history of Gasconade County were added as a part of a centennial celebration in 1998. A capital improvement fundraising campaign is now underway to help fund courthouse renovations and repairs. A much-needed new roof was installed in 2017.